Being a mobile DJ can be quite a solitary existence. Who do you turn to for advice or support? How do you find the answer to a niggling question or solve a little dilemma? Do you need to bounce some ideas off someone? One of the many benefits of being a member of AMPdj is the support we offer our members who can email us or pick up the phone seven days a week. Those who have used this service have found it invaluable. Here at AMPdj HQ, we have an on-going survey with clients. The information has given us a unique insight and helped us see things from the client's perspective (which is often very different from the DJs). We talk to many DJs in the course of a week too and, as such, have a good overview of the industry on a nationwide scale. One of the many benefits of being an AMPdj member is receiving extra client enquiries. Through the client survey, we have a better understanding of what clients are looking for and what is important to them. If you find your email response isn't having the desired effect, you can send it to us for advice and critique. When designing a website it is tempting to present it from a DJ's perspective. It is harder to design it from the client's viewpoint, which is where we come in. We will critique each page of your site, offering suggestions to ensure it is appealing and client friendly. With backgrounds in both design and writing (one of us used to be an English teacher!) we can also check for typos and grammar anomalies. If you need to generate more bookings, we are on hand to give you ideas or look over your existing marketing material. We have helped many members design effective leaflets and given them suggestions on distribution. Whether it's dealing with non payment or a complaint, we are on hand to offer advice or put you in touch with someone who can help. We have some sample letters for you to use in the members area, but are also here to help you write a bespoke one specifically for your circumstances. Unforeseen mishaps such as an accident or illness needn't cause you to worry about letting a client down. Our phones are manned up to midnight every day so we are available to support you in case of an emergency and find replacement cover if required. If you need the services of a web designer or PAT tester, we may have the answer. Many of our members have skills in other areas and offer discounts to fellow members. We have a list of 'useful services' provided by fellow members in the login area. If you don't see what you are looking for, then give us a call. From contracts to risk assessments and hire agreements to planners, we have the basic proformas for you to adapt to suit your own circumstances. They are all available to members in the login area. If we don't know the answer, we often know someone who does. We will happily put you in touch with other members. Through AMPdj a lot of strong friendships and affiliations have emerged even from one end of the country to the other! 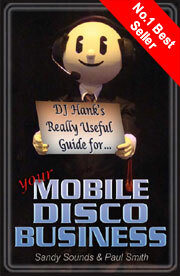 Much of the advice we offer has been compiled into a book; 'DJ Hank's Really Useful Guide for Your Mobile Disco Business' is available in both eBook and paperback formats. It's a number one best seller on Amazon and has received some glowing feedback from both DJs who are new to the industry and those who have been around for a long time. All profits from the sale of the book are for charity and we've provided a free sample of the first four chapters right here. The paperback edition of DJ Hank's Best Selling book is now available. With 40 chapters & over 180 pages in full colour, it covers all aspects of running a mobile disco business. All profits from the sale of the book will go to charity and thanks to Denon DJ, CD Pool, DJ Event Planner and AMPdj for their generosity in making this possible. Blue Aran 9-14 Britannia Road, SO14 5RH Southampton.